April 28, 2014 By Tina M 18 Comments This post may contain affiliate links. Read my disclosure policy here. Something weird is happening at our house. Our baby is eating solids and she actually likes all kinds of foods! I’m so thrilled and I’ve been trying to think outside the box and come up with more finger foods for baby and toddler. This is our ticket. Our time. We must introduce her to finger foods in all their variety before little miss toddler starts brainwashing her with her silly ideas. The race has begun. Who can influence her most over the next several months? Toddler vs. Parents. Do you feel like you’re on a reality T.V. show yet??? 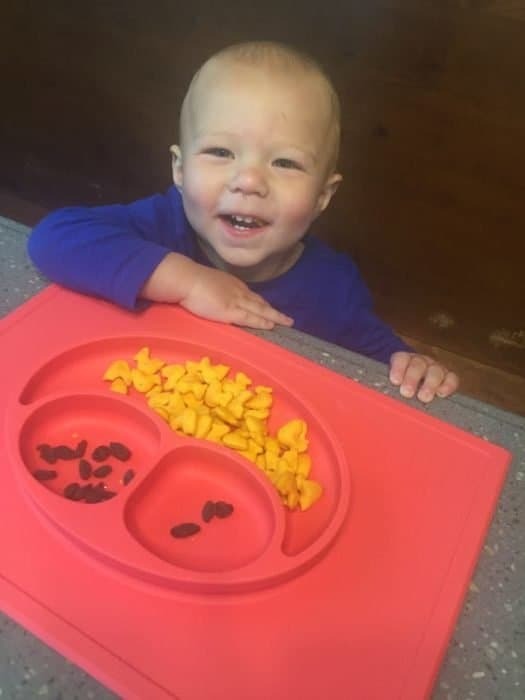 Well, just in case your life sounds similar…here is a list of ideas I have brainstormed (These are also my favorite) as good options for finger foods for toddlers. I would love to hear any added ideas! And speaking of finger foods for baby and toddlers, have you heard of the EZPZ mats?! They are AWESOME for toddlers because the silicone suctions to the table or high chair tray! And they can be washed in the dishwasher! ***Disclaimer: (don’t you love how everything has to have disclaimers in today’s world)? I AM NOT A PEDIATRICIAN. Please consult your pediatrician for individual recommendations and concerns. This post is for informational purposes only. In no way do I intend to give you personal dietary recommendations for your child. I also have no way of predicting the age or amount of teeth for each of your children. Please cut up finger foods according to the age and development of your child. Also, there are going to be things on here that you might never feed your children, this list is meant to be general and apply to households in the masses 🙂 I try to avoid processed foods, but occasionally they have been real lifesavers. *ON A SIDE NOTE…I have a somewhat funny story when it comes to toddlers and eating. My toddler was 18 months when I had my second daughter. When I was at the hospital about to give birth (close to 15 minutes before the actual birth in fact), my little sister called us crying. She said that our toddler had choked and that she had to do the Heimlich. Not exactly the kind of news I wanted to hear as I’m pushing out child #2. So please…make sure you know how to do the heimlich…you never know when you will have to do it (and make sure babysitters know it too)! And if you’re interested in our 2nd daughter’s birth, read my tips for labor and delivery. Rinsed Pinto Beans (as well as other beans. Cut up as necessary). Whole Grain Pancakes (cut up. We like to add unsweetened applesauce for dipping). *Annie’s also recently came out with a “Bernie’s Farm” line of crackers and animal cookies and they are colored with fruit and veggie juices. made with organic wheat, and No artificial flavors, synthetic colors or synthetic preservatives. We tried them this week and they make great finger foods for toddlers! Right now in my current stage of life, it’s too hard to go organic for everything, but when possible..I try to do so with my kids snacks. The more I read about the junk that’s in a lot of things these days, the more I want to turn to the companies that are doing things right! What finger foods for baby and toddler would you add to the list? I agree, my 4 yr old used to eat Salmon, Quinoa and Broccli on a regular basis. Now she is a super picky eater!! Wow! Great list. Thanks for sharing! Thanks for the list! This is great. My little loves everything, and at home eats whatever I do, but I’m constantly looking for easy on-the-go snacks and there are a few on here I never thought of. I use cut up toast both at home and on the go. My little guy loves it. Great one! My daughter loves toast too! I love that you can now buy refillable pouches for applesauce and such. Money saver! Hi There! I really like your list and I really appreciate your disclaimer at the top. I’m just writing because I saw the whole grapes in the picture (which don’t show up in your list, incidentally) and was a bit worried that clueless people would look at the picture and not read everything, and then feed their toddlers whole grapes, which could be dangerous. That is all. Thank you for your list! Love this list! Is there a way I can print this list to use for quick reference? I think it’s sad that it would be easier to change your picture including whole grapes because people are not responsible enough to read an article prior to passing judgement. Btw, I really like your site in general 🙂 Your a great writer and have good insight into practical and loving parenting! Cubes of tofu could be added to the list and I know it sounds gross but livers too. I started giving my 9 month old chicken livers to increase his iron intake (very important for brain development) and he loves them. I hate cooking them but he really enjoys them! Thanks so much for this! We try to avoid processed foods for our 12-month-old and I’ve been feeling a real lack of finger food inspiration lately. I’m going to print out this list and stick it to the frig! Thanks! Always looking for healthy food options for my little one. Thank you! Love your bio (I’m only 5’11” and feel the same way!). Thanks for these ideas, I’ll take any help I can get.